Every day I pass by the Moschino store when I go to work (along with many other stores, which makes for a very stimulating walk). 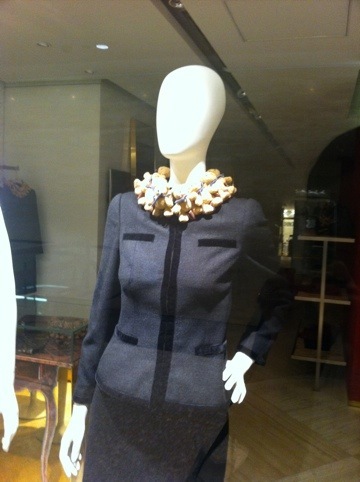 Recently they changed their display to the FW12 collection. On passing it looks like just another suit set with a lumpy collar. But then the lumpiness appeared to resemble arms/legs……I initially thought it was my sleepy eyes, but upon closer inspection, it appears to be a chain of Teddy bears! If that isn’t one of the most bizarre things I’ve seen this season. Not that I have anything against stuff toys. I am a big kid at heart. 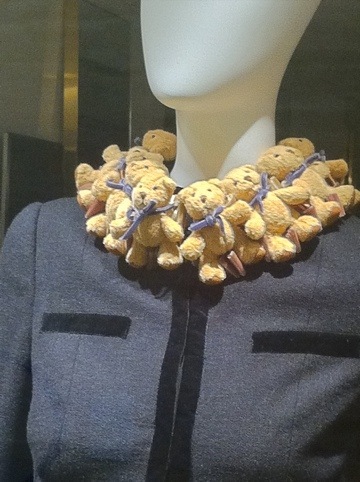 But having a chain of them wrapped around my neck while wearing a business suit is just a little disturbing. I sincerely hope this is a marketing display gimmick to get me to take a second look!